Like moths to the light, humans are bizarrely attracted to all things shiny and sparkly. Apparently, it stems from an evolutionary instinct to seek out shimmering bodies of water. Perhaps this link between glossy items and human hydration could be the reason why we seem to have such a penchant for glitter? Let's be honest, glitter is a totally useless item. A five year old creating their next collage masterpiece might disagree with you, but glitter satisfies no need other than the desire to channel our inner-unicorn. I'm personally a sucker for a bit of glitter. It makes me feel like a real-life, oversize fairy. And what could be better than that? Caring for the environment, for one thing. Glitter is essentially just teeny, tiny bits of pretty plastic. Plastic never breaks down, and is bad news for pretty much everything that calls the Earth home. Like most other types of plastic glitter can't be recycled. If you've ever tried, you'll know how hard glitter is to clean up, so using it again or upcycling it is out of the question. Glitter is usually made of some kind of non-biodegradable material, such as copolymer plastic or aluminum foil. Like the harmful micro beads you'll find in many cosmetic products, glitter pieces are tiny, and are classified as 'micro plastic'. [Image caption] Microplastics on the beach. Image by Seachair. Plastics are entering oceans worldwide at an alarming rate. There's 8 million tonnes of the stuff ending up in the ocean every day – the equivalent of one garbage truck of plastic every minute. 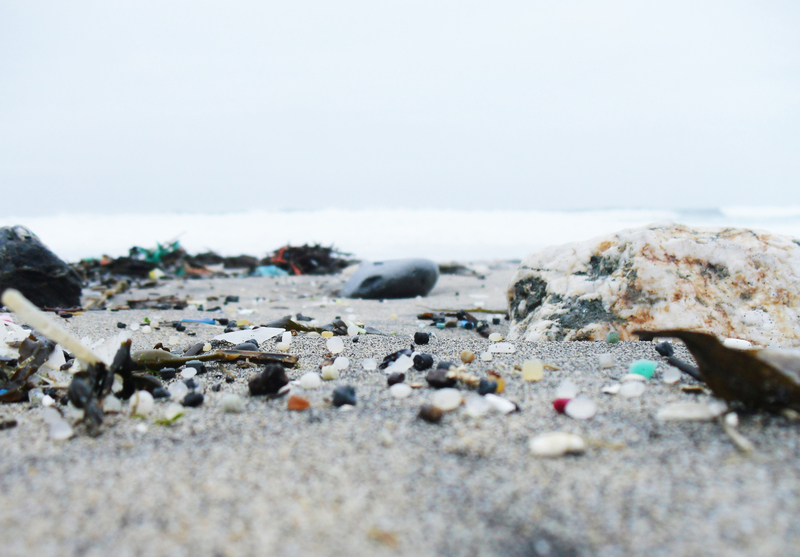 As the name suggests, microplastics are itty bitty pieces of plastic that measure less than 5mm. Microplastic is one of the worst kinds of plastic, and accounts for 85% of plastic found in the environment. The size of microplastics allows them to be ingested by the tiniest of organisms, and this is posing huge problems for aquatic life and consequently, us. Microplastics move through the food chain, starting at the bottom (studies have shown that even oysters are ingesting plastic) and then working their way up as animals eat each other. Fish that get caught for human consumption are increasingly beginning to contain plastic particles, and microplastics are starting to kill fish before they reach reproductive age. Cutting plastic-use wherever possible is key to actively contributing to solutions to the seemingly ever-growing problem of plastic. Opting against using single-use products, particularly those which we do not have a real need for is hugely positive lifestyle change. But without glitter, how will I sparkle like a disco ball on a Saturday night!? This is part where I provide a replacement for glitter, and I will, I promise. But think about it, do you really need glitter? I don't want to be a party pooper here, but we don't need more useless stuff in our life and society's addiction to disposable products like glitter is damning for the Earth. And you know what, I'm sure you're sparkly enough without the addition of glitter! If you really can't do without a bit of shimmer, Lush cosmetics announced it would no longer plastic particles in its glittery products. Some companies are making 'biodegradable' glitter, but bear in mind that items claiming they are 'compostable' or 'degradable' are only so under certain conditions. If you want to get your DIY on, creating glitter from natural ingredients is a fun way to get outdoors. Evidentially, all that glitters is not gold (or good for our environment). When we're throwing it around at music festivals or parties, we're basically just littering with gleeful abandon. Being mindful and aware of the impact of the products we buy is key to making changes in our everyday life.